Baked Popcorn Chicken that tastes like KFC! The easiest recipe for baked popcorn chicken that can be made two ways – spicy and non spicy! 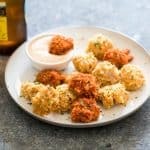 Tastes like KFC, but gluten free and guilt free for the perfect party appetizer. Guys we are doing popcorn chicken today but making it totally guilt free because it’s still January. And we haven’t forgotten all our resolutions yet. Except the one about not stuffing our face. But I’m definitely making it easier. With this KFC style Baked Popcorn Chicken so that you can stuff your face as much as you want. Ain’t that the best? I know how much you love my KFC style Popcorn Chicken because it is one of my most pinned recipes on Pinterest. But I also know how we are all trying to eat better. But we can’t give up on popcorn chicken because it’s our favourite party popper right? So I’ve been testing and baking and I think we are finally ready to share this amazing recipe. I’ve pretty much eaten an entire batch all by myself twice. Pragya ate the other batch last night. I think it’s safe to say that our love for baked popcorn chicken continues. I’ve been working real hard these days. On myself. Sleeping early, eating right, trying to get some exercise and just making sure I’m conscious. Of my body and mind. That was one of my resolutions of this year. To not drive myself crazy thinking about how many people are reading this food blog or how many recipes I have to photograph. I’m taking it one day at a time, but mindfulness is such an important thing. Something we all forget about, and I’m happy to report that I’m feeling a lot better. Taking it easy doesn’t come as easily as you would think and it’s something that requires a lot of conscious effort. I just feel like it’s helping me prepare better, become better at work too. Like making sure I bring you a new recipe every Monday, Wednesday and Friday. So that I have time to do more for you guys. Maybe create a new set of content. Ideas? Is there anything you’d like to see? A new series maybe? A different way of sharing food and recipes with you? I’m listening guys. I hope you are thinking while I get back to this baked popcorn chicken. Because this needs a little more conversation. Like how it’s dredged in seasoned potato chips and how I am showing you two ways to make it. The red one is of course the spicy version and the cream coloured yellow ones are for all of you who don’t dig spice too much. They are both just as flavourful, but my favourite? Definitely the one with all that spice! I don’t think I can do food which doesn’t at least have a slight kick in it. And if you are veering towards the non spicy version, stop. 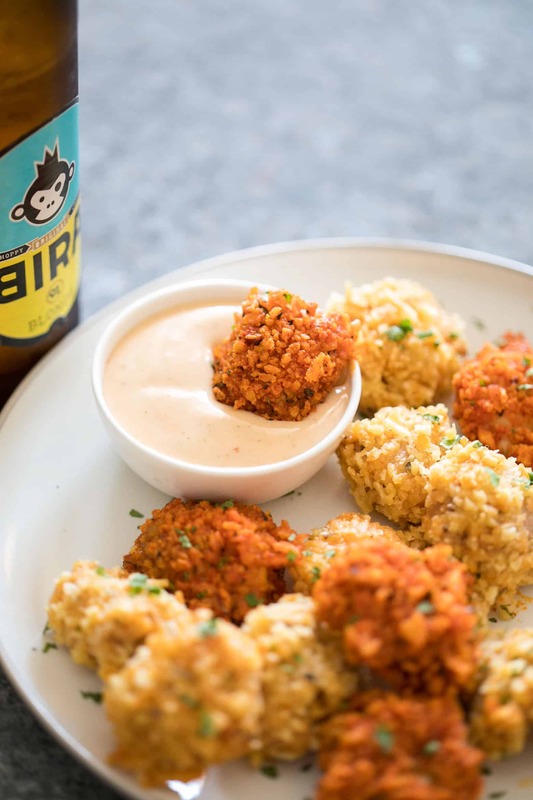 Try the spicy baked popcorn chicken and you’ll never look back. You can actually do both at the same time, because it’s the same base and it’s really super easy to make! Potato chips are such a fantastic way to coat these because they come out of the oven really crispy and if you get some sriracha mayo dipping sauce, you’ve got yourself a winner! If you try this recipe, I’d love to see your creations on Instagram. Tag your pictures #myfoodstory and I’ll be sure to say hi! The easiest recipe for baked popcorn chicken that can be made two ways – spicy and non spicy! 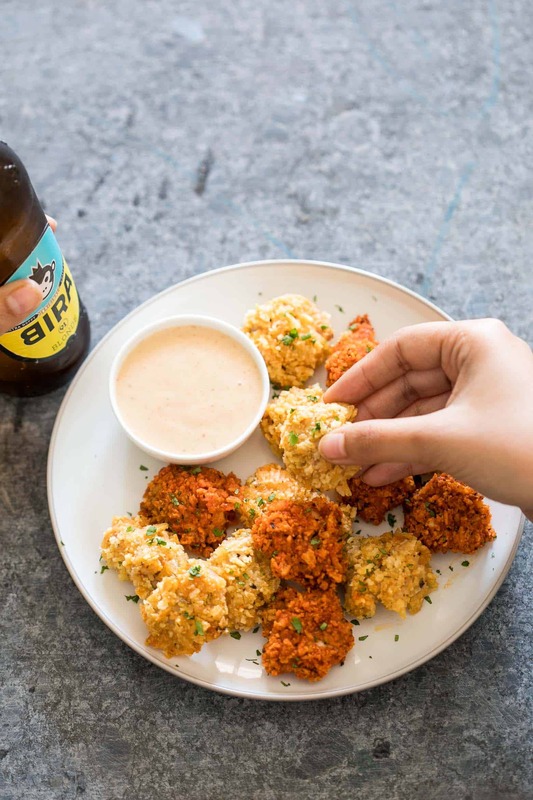 Tastes KFC style, but gluten free and guilt free for the perfect party appetizer. Mix all the ingredients under marinade with the chicken and set aside for half an hour or up to two hours. Before you begin making the crumb, read the instructions carefully. I’ve mentioned two different recipes for the crumb, one is spicy and the other is non spicy. You can either pick one or choose to do half of both. Each crumb coat mixture is for 400 grams chicken. Pre-heat the oven to 200C/ 400F. Set a cooling rack on a baking sheet and spray or brush with oil. To make the crumb, pick the crumb coating of your choice, and mix all the ingredients well. The potato chips should be crushed to a breadcrumb like consistency. 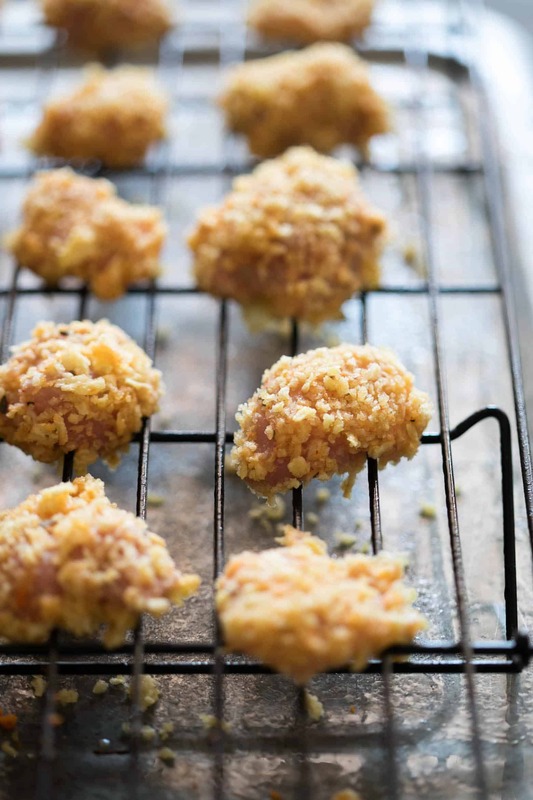 Now taking one chicken piece at a time, shake off the excess buttermilk and dip the chicken piece in the crumb coating making sure to dredge it evenly. Place the chicken on the prepared cooling rack. Repeat till all the chicken pieces are crumb coated. Brush or spray them lightly with oil and bake for 20-25 minutes, gently turning them halfway through till the pieces are cooked through. Serve immediately. The potato chips we use to crumb the chicken, any brand from the market would do? Or anything specific? I use lays, but kettle chips or any other brand will work! Thankyou 🙂 can’t wait to try this! I absolutely LOVE KFC’s popcorn chicken! And since I try never to go there lest I get myself in trouble and eat all the chicken I can’t wait to make this recipe! I miss KFC! Now I can make it and I am going to, looks amazing Richa. Thanks, I hope you like it. The popcorn chicken is really the only thing I like at KFC and I had to recreate it at home! These look delicious! My hubby and kids would love these – especially the spicy ones! I’ve never tried to dredge chicken in potato chip crumbs before, will definitely have to give it a shot.